The UCSD Women’s Ultimate team was founded in 1995 by Beth Lewis (then known as Beth Phillips). Upon her arrival at UCSD in the Fall of 1995, Beth recruited a few young women to play ultimate and founded Psycaughtit (later shortened to Psycho during the 2001 season). This little team would have to face some big competition against other universities with strongly developed Ultimate programs if they wanted to make Nationals. They took this in stride and hastened to develop as a team. 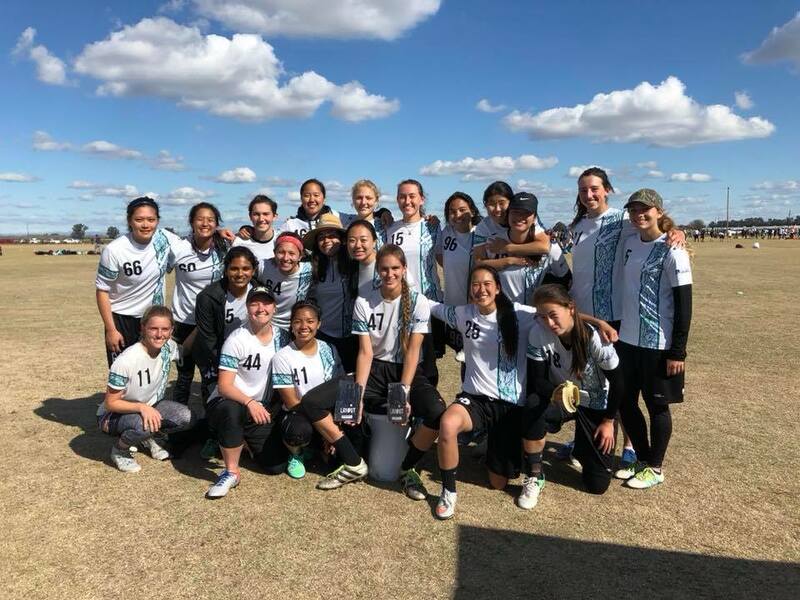 Within a couple years, Psycaughtit took first place at the UPA College Women’s Southwest Regionals and qualified for Nationals for the first time. A couple years later in 2002, the Psychos headed to Nationals in Spokane, WA and returned home as the 2002 UPA College Series Women’s National Champions. Their first National title! They were usuals in the Nationals lineup for the next few years following their win. After coming close to qualifying for several years, the Psychos returned to their first USAU (formerly UPA) National Championship in 2017. It was the Psycho’s first trip to Nationals in over 10 years and everyone, including the team, was surprised they had made it. Since their return this season, each player has had their eyes on the gold. They work tirelessly to make their dream a reality, practicing four times a week and spending every waking hour outside of school thinking about how they can make the team better. So far their work has paid off. This season, they've won the prestigious Stanford Invite and later, became Regional champions. Now, with a little Nationals experience on their back, the Psychos are getting ready to take their shot at it all at the 2018 USA Ultimate College Championships in Milwaukee, Wisconsin from May 25-28th. With their spot now confirmed at Nationals, the Psychos need help getting there. Unfortunately, tournament fees have continued to increase in past years, and Nationals is no exception. From rental cars and hotel fees to the increased price for each player to participate, the team is not able to fund this next big step on their own. We hope to fundraise enough to at least pay for the team’s ground transportation and tournament expenses (tournament fee, housing). Any money beyond this will go to supporting each Psychos’ airfare, which they are currently individually responsible for. Please Give and Spread the Word! Please consider supporting the Psychos heading to Nationals! Any gift, big or small, is tax-deductible and will contribute greatly to our campaign. Please share our CrowdSurf on social media and rally the Psycho Nation as we prepare for Nationals! Thank you! Cover ground transportation for one player for one day! Cover the bid fee for one player! Rental car for a day for 5 players! Cover hotel expenses for one player for five nights!